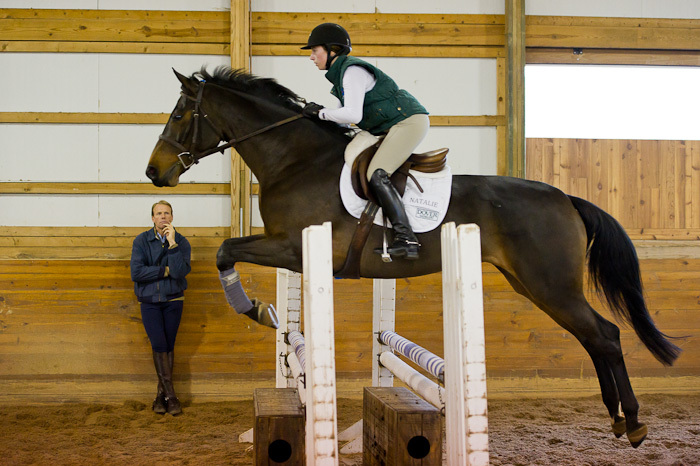 Olympic gold medalist Peter Wylde traveled from his home base of Elmpt, Germany, to work as the lead clinician during the United States Hunter Jumper Association Emerging Athletes Program Finals in Illinois. He instructed the riders over two days while they got to know their borrowed mounts and then will judge them tomorrow during the final day’s competition. Observing Peter teach for during the EAP Finals is a huge treat for me. I always return home with greater knowledge and inspired to continue working toward improving my own riding skills and further educating my horse. This weekend I’ve also been fortunate to share a car with Peter, and I’ve enjoyed our conversations about horses, training and life as we drive to and from our hotel and the stables. While attending the EAP Finals is a part of my job, it’s one that I look forward to each year. I’m fortunate to be able to combine my work with my passion for horses. And this is one weekend that allows me to put the exclamation point at the end of that sentence. I loved learning so much! My daughter Marina was a finalist and she too walked away with so much knowledge that we can both continue to imemeny at home with our horses.